A simple Mantra Remedy, which makes the use of a Rudraksha Bead is described by me in this post. This is an uncomplicated Mantra Remedy, which is said to enhance the chances of a job-seeker, seeking new employment or trying to get promotion, pay-rise, good transfer-posting and progress further in his present employment. To perform this Job Mantra Remedy the practitioner should take a Char Mukhi Rudraksha [Four Faceted Rudraksha] on a Monday and weave it in a Red Colored Thread. Then he should sincerely worship the Rudraksha by offering it Dhoop and Diya and the site down comfortably in-front of the Rudraksha Bead and chant the Shiva Mantra – Om Namah Shivaya – ॐ नमः शिवाय 11,000 times using a Rudraksha Beads Counting Rosary. The Mantra Chanting should be completed till the next Monday. 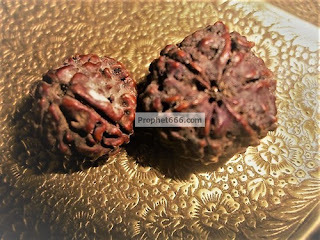 After the Mantra Chanting is completed, the practitioner should wear the Rudraksha around his neck and then visit a Shivalaya and take the blessing of Lord Shiva and then distribute some white colored sweets to other devotees inside the Shivalaya or to the poor people who usually site outside temples seeking alms. Notes- women should take care not to perform this Mantra Remedy on the days where there are chances of it being interrupted due to their Monthly Cycle. Is it 11000 times eveeyday or 11000 times in total? 11000 Mantra Chants is the total number. If one lives abroad. Can we worship Lord Shiva at home? Sure, you can do that, if there is no Shivalaya in the area. My husband wants to perform this advise. on Monday itself and chanting have to be started from the same Monday or it can be purchased on any day and the chanting have to be start from Monday only. The Rudraksha can be purchased earlier, but the remedy should be started on Monday.